Sustainability matters. Fishermen understand that if they overfish, there will be no more catch. Consumers understand that protecting our oceans is important, and therefore buying sustainably harvested seafood is the right thing to do—if they can find it. 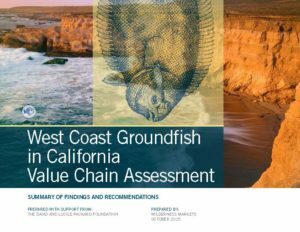 The California groundfish fishery is one of the first fisheries to implement management practices designed in collaboration with managers and harvesters that have resulted in a biological rebound over a wide geographic area. However, despite this progress toward protecting the fish, the long-term economic stability of groundfish harvesters is uncertain. Why is this, when this fishery has made so much progress? With the support of the David and Lucile Packard Foundation and the Gordon and Betty Moore Foundation, we set out to find some answers. Using a USAID Value Chain approach, we evaluated the value chain in California in order to identify constraints and opportunities that could be addressed to improve the financial viability of harvesters and to attract impact investment capital—thus ensuring the long-term economic sustainability of the fishery at all levels. This document provides a summary of our findings and key recommendations for investors and philanthropies, harvesters, management, processors and distributors and end markets.